One of the most important resources in producing food, fiber, or forages is the soil. Although it is considered a renewable resource, it is a slowly renewable resource. It has been estimated that it takes from 100-1000 years to regenerate one inch of topsoil. The loss of valuable topsoil has literally changed the human history because it changed the ability of past civilizations such as ancient Greece to produce their own food. In a very real sense soil erosion continues to change human history. Today we speak of a process known as desertification. Desertification is a term with its origin in the 1970's, when it was used to described the expanding desert in areas south of the Sahara Desert. The result is the loss of soil that was once useful for food and forage production. In more recent years desertification has been defined as the process by which desert like conditions develop in areas that do not normally have desert climate. A number of causes have been suggested to explain desertification. Although the process is not completely understood there is agreement among some scientists that human activities may play a major role in this destructive process. These activities include overgrazing, deforestation, and human induced climate change. Aside from desertification, there is no doubt that human activities are a major cause of soil erosion in general. Construction of roads and buildings, logging, mining, and agricultural production have resulted in large amounts of soil erosion in the U.S. and around the world. When soil erodes, it is usually the topsoil that erodes first, which means that the potential of the eroded area to produce food or forage is greatly reduced. In addition the eroded soil may be deposited in rivers or lakes. The cost of removing the deposits may be considerable, and if the eroded soil was contaminated in any way the deposited soil may spread the contamination over a wider area. Agricultural production, including forage production, involves removing vegetation from the soil surface. Plowing, cultivating, mowing, and grazing are examples of how vegetation is removed in forage production. The extent of soil erosion depends to a great degree on how the removal of vegetation is handled. Leaving the soil surface with little or no vegetation provides a prime opportunity for soil to be eroded by wind or water moving across the soil surface. Responsible forage production involves a number of production practices that may be used to minimize soil erosion. In general, the key to minimizing soil erosion is to avoid leaving the soil surface devoid of vegetation. The time that the soil is typically bare, and thus most susceptible to erosion, is after plowing to prepare a seedbed. To minimize the problems arising from plowing some crop producers have turned to so called conservation tillage. Conservation tillage is any tillage system that conserves the amount of vegetation or crop resides left on the surface. Two major categories of conservation tillage are no-till or minimum tillage production systems. In no-till planting the vegetation on the surface is first killed with a broad spectrum herbicide. Then a special planter is used (usually known as a no-till planter or drill) to plant seed directly through the dead vegetation. A modification of the no-till approach is known as minimum tillage. As the term implies some tillage is used but not as much as with traditional plowing with a moldboard plow. In minimum tillage specialized tillage and planting equipment are used so that only part of the soil surface is disturbed. One specific example of minimum tillage would be ridge till, in which 4-6 inch (10-15 centimeters) ridges are formed in the soil. The crop is seeded in the ridges, leaving much of the surrounding soil relatively undisturbed. In addition to using conservation tillage to establish forage stands, there are other steps forage producers can take to minimize soil erosion. Planting windbreaks will help reduce wind erosion. Some studies have suggested that the reduction in wind speed may be effective as far as 15 times the height of the trees. Steps to minimize water erosion would include reducing the effective steepness and length of slopes through the construction of terraces. Reducing the velocity of water moving across the soil surface will reduce water erosion. This may be accomplished by using strip cropping. In strip cropping a row crop such as corn is planted in strips that alternate with strips of a forage crop such as alfalfa or grass hay. Another way to reduce the velocity of water moving across the soil is to plant and cultivate crops parallel to the natural slope or contours of the land. This technique known as contour tillage, may sometimes be combined with strip cropping and is known as contour strip-cropping. 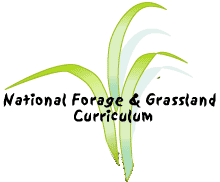 Forage production typically involves haying and/or grazing animals. Hay cuttings should be timed to maintain a healthy productive forage stand. A stand weakened through improper cutting management may begin to thin out, leaving areas of soil not well covered by vegetation. This result is a subtle, gradual increase in soil erosion. Similarly, overgrazing pastures or rangeland leaves areas of soil unprotected by vegetation which leads to greater levels of water and wind erosion. In forage production, it is almost inevitable that some soil erosion will occur, despite the best efforts to combat it. Nevertheless, responsible forage producers will take appropriate steps to maintain a healthy vegetative cover to protect soil against excessive erosion. This will require appropriate use of conservation tillage techniques, timing hay harvest to maintain healthy stands, and careful management of grazing animals to avoid overgrazing.